Recently, a COO who had been out of work for a while told me he would never again be without a personal network. Unfortunately, this COO is not alone. Too many executives fail to make time in their schedules to connect with people outside their immediate focus, resulting in too few options when they suddenly find themselves looking for a new job. The best time to start building a network is before you actually need one. Executives who have taken the time to establish relationships and trust with a diverse network of people find it easier to move to the next step, whether it’s finding a job, founding a company or looking for something meaningful to do after retirement. Executive networking pays off in two important ways: making the process of doing business easier and more profitable; and enhancing personal growth and opportunities. Networking is an investment in both business and personal net worth – and a valuable way to spend executive time. Networking is a way to find the people who have or can get what you want – or never knew you needed. It gives you exposure to a wide variety of contacts that can lead to sales and early information about opportunities to grow, possibly into areas you’ve never before considered. Networking can also lead to innovation. When you open discussions with people outside your industry or expertise you tap into new ideas to save costs or enhance products and services, operations and other aspects of your business. Putting yourself in a position to share experiences with people outside your normal circle can only lead to positive outcomes: confirming you’re doing the right thing, keeping you from doing the wrong thing, or trying something entirely new. And there’s another advantage for your business. When executives from your company are visible and active in the community, you enhance your brand and your reputation. If executives spend time networking at all, it is typically for business reasons. The arguments for developing a personal network are equally compelling. The most obvious is to create a base for a job search. When you know a broad and diverse network of people you have connections to inside information about jobs that may not yet be in the market and to people who are hiring or know people who are. People who know you and understand your skills can move quickly to make referrals and offer valuable advice. There are similar benefits to gain if you’re starting your own business. Your personal network can help you find the financing, top talent and other resources you need for an early success. Personal networking also opens up a world outside your business. The 60- to 80-hour work weeks usually required of C-levels often preclude time for personal growth. If both mind and soul are buried in business for an extended period of time you miss out on a wealth of knowledge and creativity that can enrich your life and your opportunities. Networking is about connecting, but it’s also about reciprocating. It begins with the simple act of getting a referral from someone or giving one. It is based on a relationship of trust between two people and grows from there. 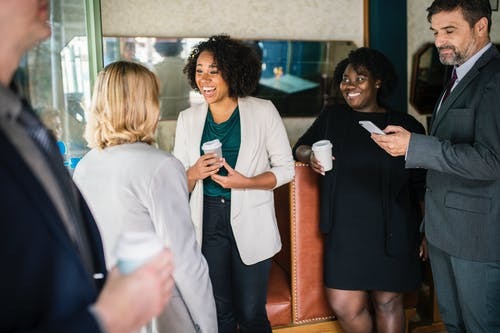 Although networking can be as casual as opening conversations with people wherever you happen to be and keeping track of those that seem most interesting, it is most beneficial when you have a conscious and active plan to expand your relationships. For executives, this plan could include attending conferences and seminars outside your industry, participating in executive Internet e-lists and associations, and joining community organizations or serving on boards. Keeping a log of networking meetings and calls makes it easy to follow up when the need arises. When meeting people you are particularly impressed with, make it clear that you are open to helping them with referrals and advice. Networking doesn’t have to add much time to already full executive schedules. When you make a conscious effort to get out of the office and talk with people a few hours a month, the benefits to your business will soon become apparent. And if you should lose your job, well, you’ll never be without a personal network again.